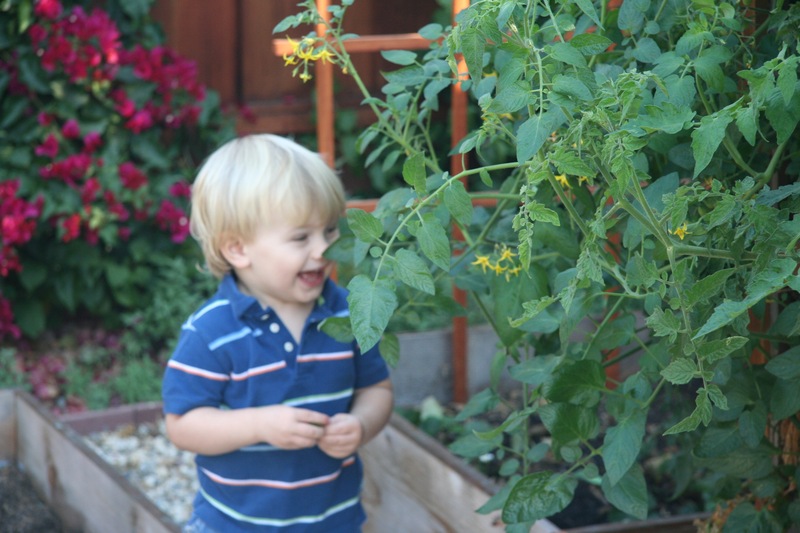 One of the things I have not shared yet on this blog is that I love to garden. When I moved back to the Bay Area in 2001, my wife and I lived in an apartment for two years. However, even there, I managed to jury-rig five planter boxes and some grow lights on a timer to try and grow herbs, peppers, and tomatoes on the balcony. They turned out surprisingly well, although I never got a lot of fruit out of the tomatoes. 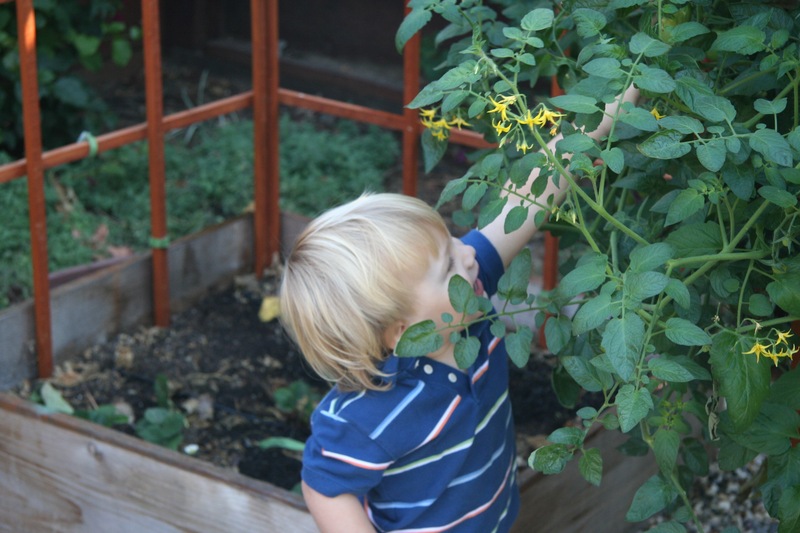 One of the great things about owning a home, for me, has been the ability to garden. 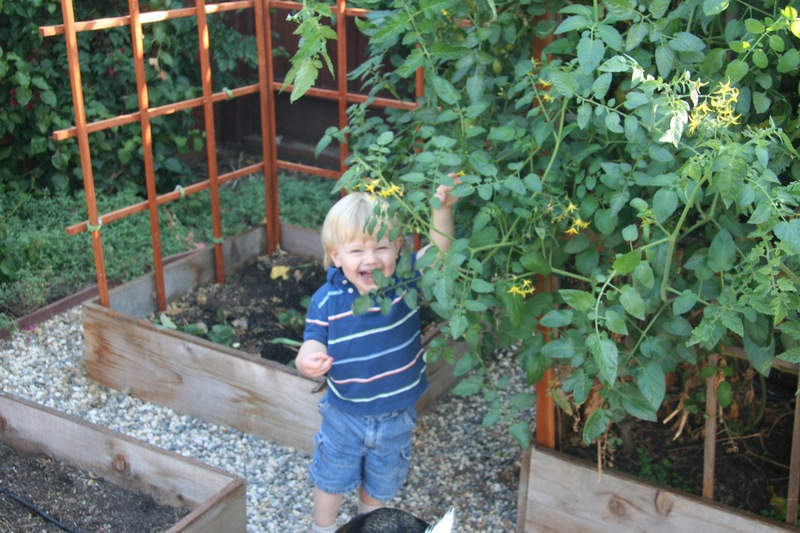 In 2004, I built three planter boxes in the backyard, and this was the first year I tried to grow tomatoes in them. Daddy, did you see these? My son, Jacob, who is exactly 3 feet tall, is provided for some sort of scale. 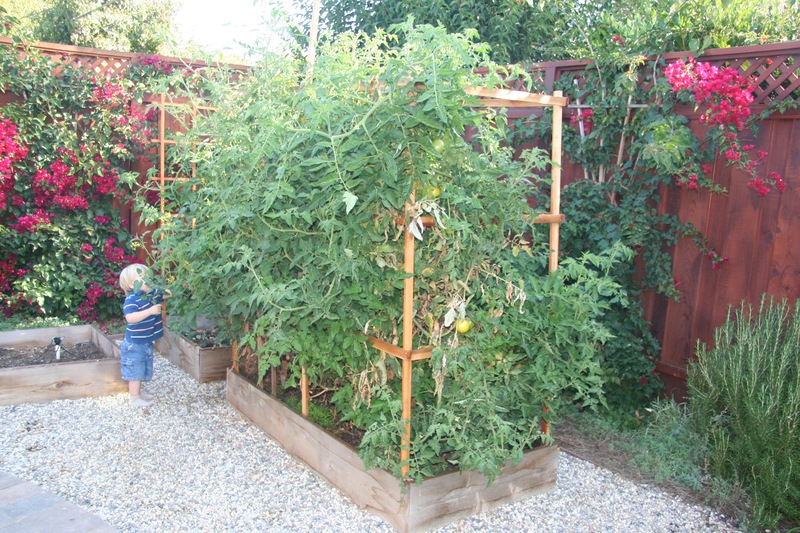 The redwood box around the tomatoes is approximately seven (7) feet tall. Nothing magical about the box. Just 1 foot above the ground, one inch cedar planks. Soil is 1/2 compost, 1/2 standard bag soil. 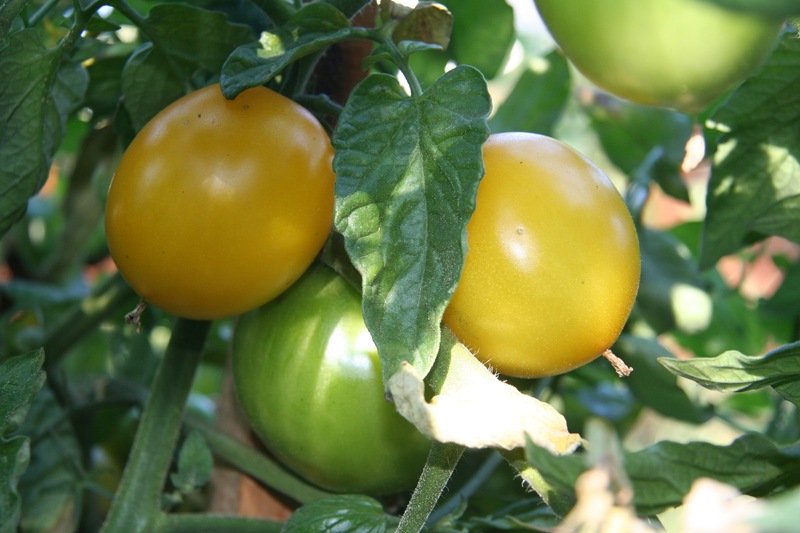 I planted three tomato vines this year – a hybrid grape tomato (red), a lemon boy hybrid (yellow), and an heirloom variety called Mr. Stripey (red & yellow stripes). All did shockingly well, although the two hybrids are the overgrown ones. There is a funny story for the redwood frame. In August, we went away on vacation. When we came back, the tomato plants had grown so large they actually tipped over and bent the 3 1/2 foot steel cages! I had to rebend the cage as best I could, chop away about half of the plants, and then build the redwood frame around them to support the entire mass. We lost about 1/2 the plant mass, but I saved the vines. Within a month, they had grown another two feet tall, filling the frame! 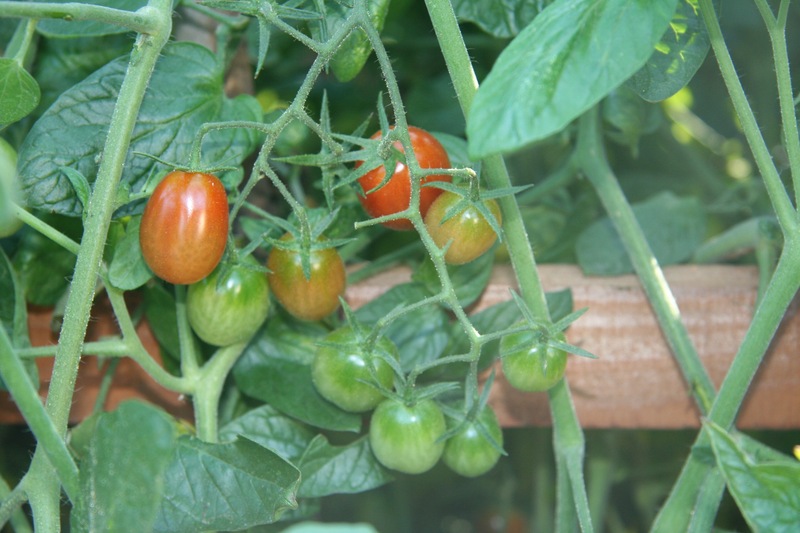 It’s nice to live in a climate where tomato plants still think November is a time to be in bloom – I’ve been harvesting my third crop this past week… if the weather holds off, it looks like I might sneak in a fourth. Anyway, enjoy the pictures. For those curious about the trellis behind the tomatoes, I also grew lemon cucumbers and cantaloupes this year, in a 3×3 box with a 6 foot trellis. I must have harvested over 50 cucumbers and a dozen cantaloupes from that small space (two vines each). Amazing! I highly recommend “vertical gardening” for the space challenged.